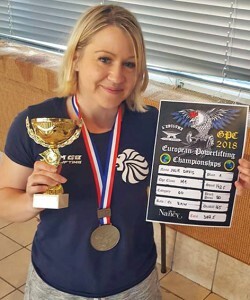 Cofton Hackett resident Julie Davis has retained her title at the European Powerlifting Championships, breaking four British and two European records. Julie is also the current World and British Champion with the Global Powerlifting Committee, having started lifting at the age of 39, four days before her wedding. “I was originally a runner but wanted something new to aim for,” she says. “I qualified for England’s Strongest Woman finals at my first event, and came 10th. She is now preparing to break more records at the World Championships in Hungary in September.